Photo from article on U.S. State Dept. Report criticizing Israel for favoring Orthodox sects (see below). Note the very close social bonds and close physical resemblance among these young men. This doubtless reflects their close genetic relatedness, their similarities accentuated by their common dress. It's an excellent one-picture-is-worth-a-thousand-words snapshot of traditional Jewish collectivism that has become politically and culturally dominant in Israel. all three [religious educational systems] are financed by the state at least 100%, if not much more. The differences between them are small, compared to their similarities. All teach their pupils the history of the Jewish people only (based, of course, on the religious myths), nothing about the history of the world, of other peoples, not to mention other religions. The Koran and the New Testament are the kernel of evil and not to be touched. The typical alumni of these systems know that the Jews are the chosen (and vastly superior) people, that all Goyim are vicious anti-Semites, that God promised us this country and that no one else has a right to one square inch of its land. The natural conclusion is that the “foreigners” (meaning the Arabs, who have been living here for 13 centuries at least) must be expelled — unless this would endanger the Jews. 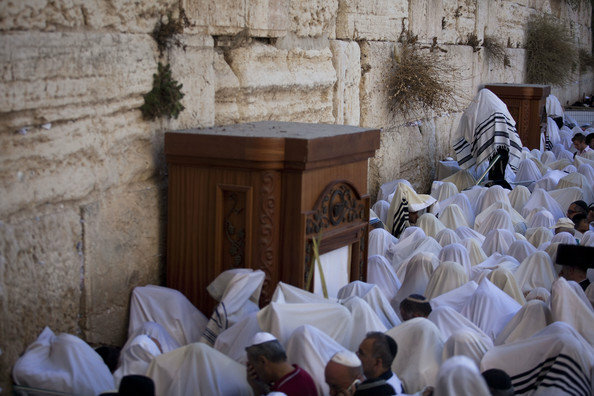 Ultra-orthodox Jews cover their heads with a prayer shawls beside the Western Wall during ceremonies for the Blessing of the Priests, or 'Birkat Cohanim', on October 5, 2009. Surprisingly perhaps, the US State Department has criticized the Israeli government favoritism toward the Orthodox, commenting that “government discrimination against non-Jews and non-Orthodox streams of Judaism continued.” The report criticized the Orthodox monopoly over marriage, burial and conversion. 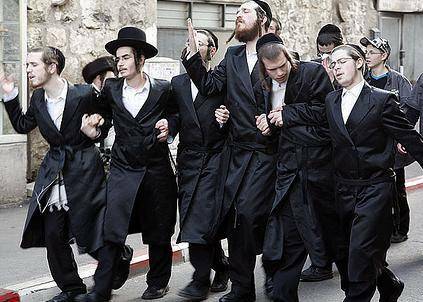 Nevertheless, these groups are the demographic engine of Israel and of Judaism in general, and there is absolutely no reason to suppose that criticism by the US government will have any influence on Israeli policies toward the Orthodox any more than it has on West Bank settlements. Avnery notes that the Orthodox have 5-15 children per woman. As always, demography is destiny. Avery suggests that the government effect a separation of religion and state, but at this point that is a political impossibility. In the future, it will be even less of a possibility. Absent external factors, the logical prediction is that the reality of Israel as a racialist, expansionist, religiously fanatic ethnostate will be more and more difficult to gloss over—even for the aggressively pro-Israel media and for politicians subservient to the Israel Lobby. And the knee-jerk support for this entity by the organized Jewish community and the vast majority of Jews throughout the West must inevitably expose the glaring hypocrisy of the support by this elite group for massive non-White immigration and all things multicultural throughout the West.